Black Core, Archival Mats in-stock at MATcutter.com! Get White Precut Mat With 4 Ply Black Core Highlighting Image! 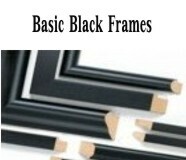 Great for Black and White images or any image that benefits from a defined edge. Suitable for original photography and traditional fine art. Black, archival core. They are .055 to .060 thick, 100% alpha cellulose (no recycled material) and only use pigmented inks that resist fading much more than the water based inks used in Standard mats. Our Conservation grade black core mats also contain Nielsen Bainbridge Artcare®, patented microchambers that proactively trap and neutralize harmful gases that can cause fading, yellowing and deterioration. Artcare technology is trusted by many of the world’s leading museums and archives, including the Library of Congress, to protect historic artifacts and documents. Window is centered so they can be used horizontally (landscape image) or vertically (portrait image). Black Core, 4 ply, Archival Mat "Blanks"
Archival black core mats allow you to have a white top color with a black core for extra contrast or a monochromatic look with black top color with black core . Use these blanks to float-mount your prints directly on the face of the matting or cut your own mats when you only need one or two of a certain window size. Suitable for all kinds of media. All mats are made from our 4 ply conservation matboard with Artcare® They are all 4 ply.